As a beauty blogger, or cosmetics junkie, I try a lot of products. But when it comes to my face, I do my best to not try it all at once, and not switch it up to often. It takes about 3 weeks for a product to show its full effects on your skin, and I usually like to use up the products I like before I move on to the next. I recently finished the last bit of my beloved Korres Wild Rose products and switched to a new routine that I've been loving. Here's what I use, mornings and nights (mind you, I'm showing you the very intense, not lazy routine. If I'm in a hurry, I'll cut it down to 2-3 products tops). I like to wake my skin up with a spritz of Vichy thermal water, then cleanse it gently with my beloved Bioderma Sensibio h20 micellar water. I've been using this for as long as I can remember and I will probably never change. 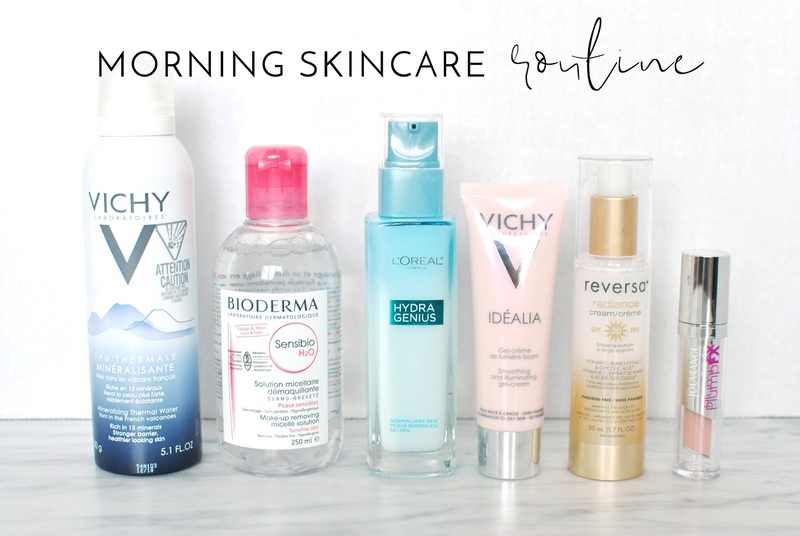 I then use either L'Oreal Hydra Genius liquid care if I'm just going out the door, Vichy Idéalia smoothing gel-cream as a primer if I'm going to wear makeup, or Reversa Radiance cream SPF30 if I'm going to be outside a lot. I finish off with Jouviance PlumpFX lip treatment - I love this stuff! If my morning routine seems somewhat simple, my evening routine is a different story. Again, I don't use every product every night, but definitely most of them. I start off by removing most of my makeup with a makeup remover. I use either Marcelle waterproof, oil-free makeup remover if I have stubborn eye makeup, or, more likely, my Bioderma micellar water on my whole face. I then hop in the shower and wash my face with whatever cleanser I'm using at the moment. Right now, my husband and I are using Nip+Fab glycolic cleansing face wash and I can't say I love it or hate it. I much prefer Reversa or Marcelle's gentle cleansers. Once my face is clean, I use a gentle toner. I only recently started using this Belif witch hazel toner but I like it so far. I have started using gentle peelings instead of regular exfoliants in order to clear up my skin, combat fine lines and brighten up my complexion. I like the Vichy Idéalia peeling lotion, but I try not to use it if I'm going to be outside a lot the next day because of the sun sensitivity. I then use my new absolute favorite face products: Clarins Hydra-Essentiel serum and moisturizer. They act like a great big glass of water for my face, smell divine, don't feel heavy on my combination skin, but are still very hydrating. I follow up with Clarins Multi-Active Eye cream - I still love my Korres eye cream but I find tubes more practical, and I love the cooling tip of this one. Once or twice a week, I apply Estée Lauder Advanced Night Repair Recovery Mask Oil to boost the efficiency of my serum. It is a bit heavy so I make sure not to overdo it. Last but not least, lips! I use a lip scrub when I remember - I love the Vanilla Bean lip scrub by Sara Happ. It is pricey but it smells divine. And I always use Jouviance PlumpFX lip treatment at night. It plumps my lips, moisturizes like no other and even makes them slightly more defined. The only downside is the stickiness, but it does look very glossy and pretty. I also use face masks once in a while, but that's a whole other article! 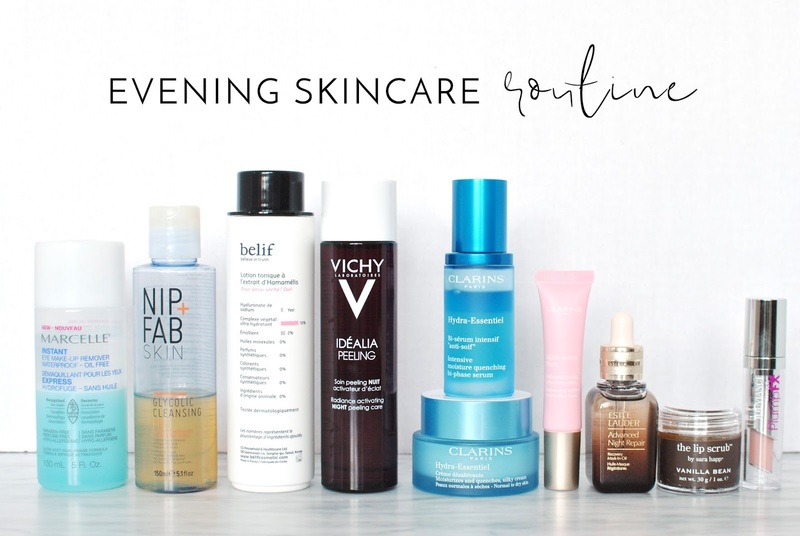 Do you have a favorite skincare brand? Thank you for sharing your routine. I have read great reviews for Bioderma Sensibio h20 micellar water. I just might pick this one up and give it a try.